You may set the columns (and column order) to be shown on new tabs; default column widths are always reset to 150 pixels. Default column widths may be changed, however, by the Save Column Layout as Default menu item. Explorer++ keeps 2 different sets of default columns for use, each with its own column order, visibility and column widths for the 7 different types of folders. one set of system defaults. This set is the set used to create new tabs. It can be altered by the Default Columns… setting (this setting - column order and visibility only) and the Save Column Layout as Default setting (order, visibility and width). Column widths are only changed when the current tab layout is saved as default. New tabs, when created, adopt this set of columns and widths. These settings are persistent , maintained in either the config.xml file or the Windows registry. one set for each tab. This set is used when the tab is switched to one of the 7 different types of folders, but is never used for another tab. 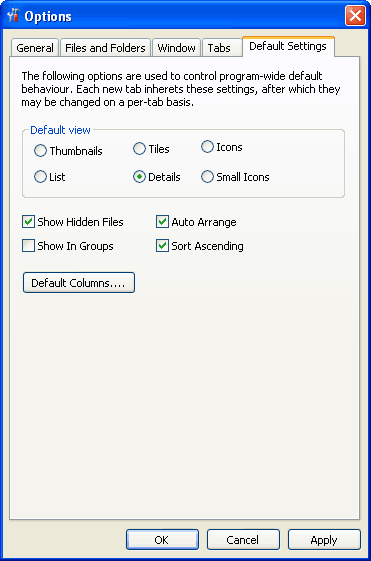 Column display settings and width changes are only maintained for this tab. If the Save Column Layout as Default option is used, the current column settings and widths (this type of folder only) is saved to the system defaults. Once the tab is closed, these settings are lost.